Galaxy Note8: How do I use Funny stickers? STEP 1. From the Apps list, tap Camera. When you select sticker icon, you can capture photos and videos with various 3D live sticker. As you move your face, sticker will track with your movements. You can also record a funny sticker that keeps moving in a video. 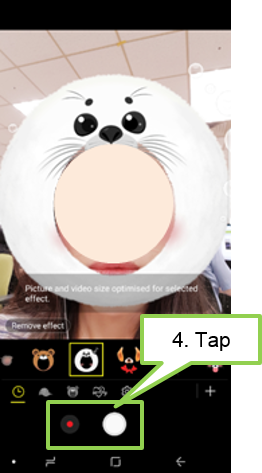 • 3D live sticker: Apply a sticker such as glasses or a cap on your face. • Live sticker: Open your mouth or blink your eyes as instructed to preview how the sticker moves. STEP 2. On the preview screen, tap STICKERS. STEP 3. Select a sticker. The sticker will move along with your face�s movements and angle. STEP 4. 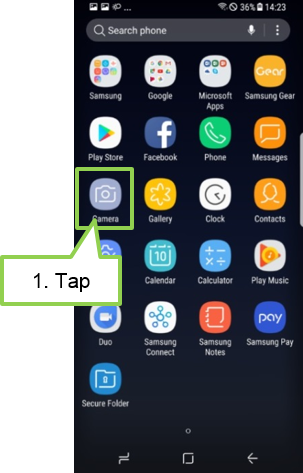 Tap centered icon to take a photo or to record a video. Galaxy Note8: How do I use high quality camera filters? Galaxy Note8: How do I take portraits using Live focus feature?